At ACT, our Special Needs Day Care is a licensed day care center specializing in the care and training of children. 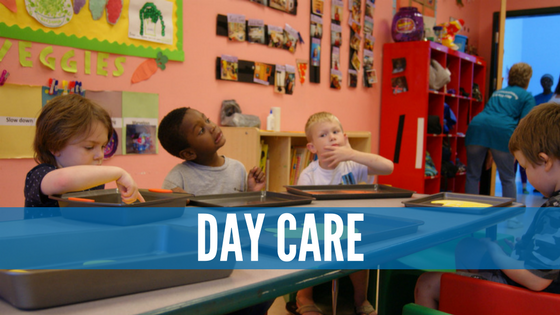 The center’s Day Care curriculum incorporates and exceeds minimum standards set by Day Care Licensing. Students use developmental learning materials to help them build skills and enable them to experience success in school. ACT works with the students’ school teachers to support their learning objectives. What's Special about Our Special Needs Day Care? Here at ACT, we call our day care center the Peanut Gallery. Every day, our students arrive, then have breakfast together. From there, we try to maintain a consistent schedule, with few weekly changes, to establish a sense of routine. Routine is something that is especially soothing to our students with Autism, but routine is also something that all our students will have to learn to work within in their daily lives outside the center. Everything we do at Achievement Center of Texas prepares students to integrate smoothly into the world outside the center, which often does not accommodate to physical or mental disabilities. What Does a Day in the Special Needs Day Care Look Like? What Goes on at Our Special Needs Day Care? Each task during the day is designed to fulfill a purpose, whether that be to strengthen skills for personal hygiene, feeding oneself, playing and interacting with others gently, academic learning and more. This time is described by Peanut Gallery teachers as “indoor recess.” Small Group Time serves as a small break from the routine so as not to overwhelm the students. During these times, students can play quietly, watch TV, relax, color and more. We have these times set in place to remind students to go to the bathroom at various points during the day. This also serves as time to change other students who will not develop this skill. Large Group Time is something that other day care facilities have referred to as “Circle Time.” During this time, we establish what day of the week it is, what all the days of the week are and what the weather is like outside. We also sing a song the alphabet song, the colors song, and we count together. During this time, the students will do more of their academic learning. This is where students will learn their letters and their numbers. All lessons are designed with each individual student in mind. We focus on intellectual abilities, not disabilities. This is what other facilities would traditionally call “Recess.” Weather permitting, we take all students out to our outdoor playground and give them 30 minutes of uninterrupted playtime. Arts Exploration is a time that our young attendees get to experience the same artistic freedom as our adult students. Our Peanut Gallery art projects are designed with young children in mind and are separate from adult projects, but young attendees will still get to make holiday-themed and season-themed projects, color, paint, draw and make collages. How Do I Enroll My Child into this Special Needs Day Care? Just click the button below to view pricing for our Day Care and apply for our program.